(Newser) – Minnesota's Twin Cities were captivated by a daring raccoon that climbed more than 20 stories up a St. Paul skyscraper Tuesday—pausing for plenty of naps along the way. 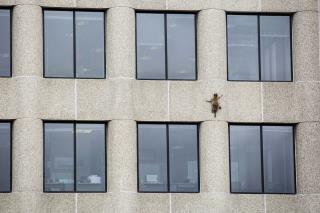 The raccoon, first spotted stuck on a ledge outside another downtown building on Monday, where it had apparently planned to raid pigeon nests, was closely watched by local media as it ascended the nearby UBS bank building after a failed rescue attempt, NPR reports. The animal made it to within a few floors of the top of the building, where live traps had been set, before slowly beginning to climb back down. Onlookers—including some on the building's 23rd floor—provided updates as the raccoon's climb gained national attention, with many worried about its safety, reports the AP. Big deal...I know someone who had a live badger in his pants and no one wrote news stories about it... https://www.youtube.com/watch?v=UOsEks6oqj8 . 23% of people think that a helpless animal facing likely death is hilarious? I think it must be terrified. I hope they manage to get a net under it to save it.